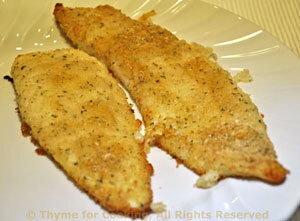 Crusted Sole, Thyme for Cooking easy gourmet main course. Sole is a delicate, flavorful fish. Here it has a light coating of crumbs.... Not so much as to overwhelm it. Lightly oil a baking sheet large enough to hold he fish in a single layer. Put the crumbs and Herbes on a plate and combine well. Dip both sides of fish in the crumbs and lay on the baking sheet. Drizzle with a bit more oil. Bake, 375F (190C) for 10 - 12 minutes, until fish are golden.